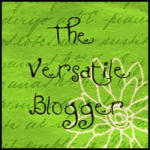 A big thanks to Wayne at http://wayneaugden.wordpress.com/ for nominating me for the Versatile Blogger Award. What an honor for such a young blog! http://goinswriter.com – Writing, Blogging How tos. http://sethgodin.typepad.com – Leadership, Business – Short, sweet and to the point. http://www.rebuildingtogether.org/ – Rebuilding Together is the nation’s leading nonprofit working to preserve affordable homeownership and revitalize communities. Our network of more than 200 affiliates provides free rehabilitation and critical repairs to the homes of low-income Americans. http://www.aglow.org/ – Aglow is a dynamic, global organization made up of women and men with a single purpose: to see God’s will be done on earth as it is in heaven through prayer, local groups, events and outreach. http://www.billycoffey.com – Sage advice from a young “old soul”. And of course there’s Wayne. Words of a thoughtful man. This man is a gatherer. The words he shares are wise words from all around. Book reviews as well. Wayne leaves no doubt about his beliefs. Thanks again for the nomination Wayne. Now the rules say I must share seven things about myself. I’ve been married to my husband for 35 years at Christmas time, and have seven grandchildren, ten and under. I enjoy learning about blogging, writing, leadership and new paining techniques. I help my husband with his non-profit – Rebuilding Together and he helps me with mine – Aglow International. I am a lifelong learner. There are not enough hours in the day for all the reading and research I want to do. I love to paint. Rooms, furniture, signs, finger nails. Anything. Stand still long enough and I might paint you! I always wanted to write a book. I decided to begin by writing a blog. To kind of get the feel of putting all my thoughts together for reading by others. My heart is to show people what a real relationship with Jesus can be like. It is so different than what religion has shown us over the years. I, too, am honored to know you Deborah! You have transformed into a mighty woman of God and it is a joy to watch your journey up close and personal. What a great honor, you do a great job as a blogger! I am blessed to call you my friend. Thanks Dear. Happy you’re still reading! Miss your face. A lot.